This page may require cleanup to meet basic quality standards. The specific problem is: Elaborate and accurately define fixes. See FO3 April 2016 edits for example. You can help by modifying the article. The discussion page may contain useful suggestions. Shares many similarities with Fallout 3 in terms of its engine and performance. Includes the Fallout and Fallout 2 Original Soundtracks for free inside the installation folder. Nexus mods, popular host for almost all New Vegas mods. S.T.E.P. Project Wiki, comprehensive modding guide. The Vault, Fallout franchise wiki. Ultimate Edition is also available. All versions except GOG.com require Steam DRM. Ultimate Edition is the complete edition with all DLC. DLC may need to be manually enabled in the launcher after purchase. Pre-order bonus, now sold in Courier's Stash bundle. Contains Caravan Pack, Classic Pack, Mercenary Pack and Tribal Pack. Decompresses the Fallout: New Vegas BSAs and repacks them without zlib compression for performance. Transcodes the .ogg sounds effects to .wav so they work. Extracts any .mp3 files to loose files because they will not play when in a BSA. Patch to make Fallout: New Vegas Large Address Aware and automatically load New Vegas Script Extender. Improves stability on systems with at least 3GB RAM. Required by many mods for them to work correctly. Expands the scripting capabilities of the game. Mod Managers simplifies mod installations, use one or the other. Basic mod manager with a simple interface, good for beginners. Advanced mod manager that keeps every mod separate, using a virtual file system. These should preferably be installed using a Mod Manager. Requires New Vegas Script Extender. Fixes several engine related bugs. Requires additional configuration for Windows 10, standard INI settings causes issues. Fixes over a thousand bugs. Fixes several bugs that aren't covered by JIP LN or Yukichigai Unofficial Patch. Fixes user interface bugs and inconsistencies. Autosaves and quicksaves automatically create a backup (*.bak) of the previous save when overwritten. Stores up to 200 MB of game saves online (maximum 1000 files). 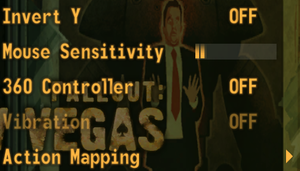 OneTweak mod: https://www.nexusmods.com/newvegas/mods/59266 or Borderless Gaming. Add to favorites by process binary name. Set in launcher. Up to 15 samples. Set in launcher. Up to 8x MSAA. 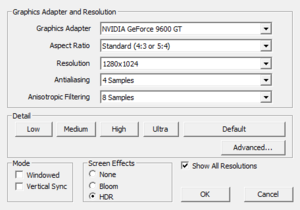 HSAA, OGSSAA, SGSSAA, and TrSSAA can be utilized through the anti-aliasing compatibility bits 0x0000F0C1 under Nvidia Inspector for Nvidia graphics card. Always enabled even when disabled in the launcher; see Vertical sync (Vsync). Possible with New Vegas Stutter Remover. Most graphics options are accessible on the main launcher screen. Many fonts become blurry and terminals may become unusable. HUD is shown on the middle/main monitor. Change fDefaultFOV=75.0000 to the desired FOV. High FOV values can cause scopes to not cover the entire screen when aiming down sights. If you use the console command fov #, achievements will be disabled for the current session of the game; edit the file mentioned above for a permanent fix. By default, windowed mode only supports a limited number of resolutions. Change the values of iSize W= and iSize H= to the desired resolution. Vsync is enabled at all times, even if the Vertical Sync box is unticked. This setting can be forced in the Fallout_default.ini file. Some menu keys are hardcoded. Player name must be entered at the beginning but default name can be chosen with controller. For DualShock use the Playstation 3 Controller mod. If disabled, it may re-enable itself after loading a save, even though it still says vibration is disabled. Use Better Steam Controller Support mod. If this fix doesn't work, load the Fallout: New Vegas launcher and then add the lines to Fallout.ini. However, you will have to add those lines every time you play Fallout. You can also make Fallout.ini read only, which will prevent mouse acceleration from being reset. Music, footsteps, voice, effects and radio. Use this mod to enable true binaural sound. Does not require a sound card. May require DirectSound3D restoration software to restore proper audio functionality on Windows Vista and later (Included in HRTF mod). Use Helix Mod: Fallout New Vegas. This is caused by conflicting character mods, this can usually be fixed with a compatibility patch or by using LOOT to fix the load order. Setting "Actor Fade" to the maximum value should fix this. Sometimes attempting to 'load' a save game does not work. Start a new game and playing it to the point where Doc Mitchell tells you to go to the Vigor Tester machine. At this point the game will autosave, and loading your previous save should work now. Load an older save (or different save). At this point the engine and game are fully loaded, loading your previous save should work now. This is faster than having to skip cutscenes and wait for an autosave, but requires having other saves on your hard drive. Caused by using the advlevel console command. Can be fixed by adding enough XP to level once again. Use the console command rewardxp (e.g. rewardxp 5000 to award 5000xp) and add enough XP to level once again. Voice acting and Pip-Boy sounds (and possibly others) can not be heard, while the radio and movement can. Can be fixed by correcting the number of sound channels in the configuration of your playback device in Windows. This happens when you start the launcher. Rightclick the game in your Steam library and select "Properties". Select the tab "Local content" and click "Verify integrity of game cache". This might be necessary several times. Steam will download the missing/corrupt files. Create a symbolic link to Steam by typing this command in CMD: mklink "Steam.exe" "C:\Program Files (x86)\Steam\Steam.exe"
Rightclick nvse_loader in the Fallout New Vegas installation folder and select properties. Select the tab "Compatibility" and click "Run this program as administrator" and apply. This could also be the result of mods attempting to change the same object. Character will continue to move or "slide" a bit sometimes even after they have stopped moving. Note that this should not be confused for the game engine forcing characters to take a full step when moving. Under the "Speed" tab, set Repeat Delay to Short, and set Repeat Rate to Slow. This fix does not work for some players. 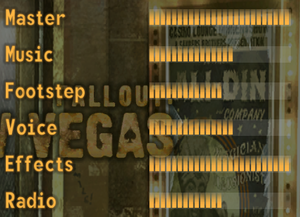 Under Profiles select Fallout - New Vegas. In section Sync and Refresh set the option Maximum pre-rendered frames to 1. Affected data files are enabled at all times, even if their boxes in the "Data Files" menu are unticked. Search for a file you want disabled with a .nam extension. Delete or rename the selected file. Repeat for any file you want disabled. If you chose to delete the .nam files, you can recover them by verifying the game data files integrity in Steam. Occurs when launching the game in any other way than through Steam due to an inappropriate Steam AppID being used. Can happen when you have a Polish, Czech or Russian version of the game. Error code P:0000065432 may also apply when the AppID is incorrect. Install the New Vegas Script Extender according to the ReadMe file found in the archive you just downloaded. Install 4GB Fallout New Vegas. Use this shortcut command line as an example. It can be used to launch the game through Nexus Mod Manager, Mod Organizer and possibly other launchers. This method only applies to PL/CZ/RU versions of the game. If it fails, try one of the methods below. This method involves installing two extensions. While being mods, they are considered essential. Right click the game within Steam, then select "Create Desktop Shortcut." Right click the newly created shortcut on your desktop and select properties. The URL address should be in the form of steam://rungameid/22380, with the last number being the real Steam AppID. This method applies whenever the AppID being launched does not match your Steam installation, such as any localized version of the game or a special edition of the game. As above, this method involves installing two extensions. While being mods, they are considered essential. Open a Command prompt using "Run as Administrator" (Start>All Programs>Accessories>Command prompt). and press ↵ Enter (if the common folder does not exist, create it). The command prompt should show the above path. If not, try the following steps. Otherwise, skip to Step 4. First, check to see if the path you entered exists. 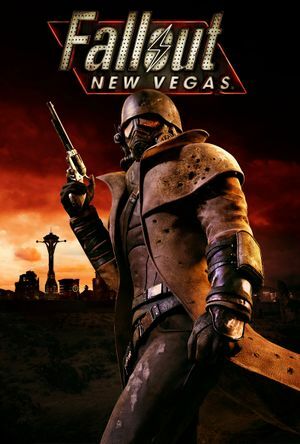 mklink /d "Fallout New Vegas" "D:\Steam\SteamApps\common\Fallout New Vegas"
and press ↵ Enter (change the example path to your Fallout New Vegas installation folder). Recreate any shortcuts using the new "proper" path (i.e. C:\Program Files (x86)\Steam\SteamApps\common\Fallout New Vegas\FalloutNVLauncher.exe). Reconfigure your mod managers to also include the changed path. This method creates a symbolic link between where the game is installed, and where it "thinks" it is installed. It allows using the correct path without moving the game files. This method moves all the game files to the default Steam folder. Make sure you have enough disk space before doing this. Pressing the tilde key on the keyboard does not launch the cheat console. Can be fixed by disconnecting the controller. The controller can be reconnected after using the cheat console. Delete Appmanifest files from the Game Library and restart Steam. Re-install the game and Steam will find the existing files. Exchange the game's .exe-files with ones from the international version, available HERE. This method also reenables the gib/gore features of the game. Use the Ambient Occlusion flag 0x00000003 with Quality or High Quality. Under Ambient Occlusion compatibility insert the flag 0x00000003. Under Ambient Occlusion setting select your quality of preference, but in order to use HBAO+ you must use Quality or High Quality. See Essential improvements for modifications that fixes bugs and improve performance. A comprehensive guide to FNV modding curated by modder SciRika. Requires all official DLC to be installed in order to work. General difficulty tweak and bug fix mod by Fallout: New Vegas' Project director and Lead designer, Joshua Sawyer. Contains crude editing, JSawyer Ultimate is a reconstructed version which fixes this. One of the mod authors, MoBurma, has listed content which has been cut from the game due to time constraints. Restores content cut from the game in a number of individual mods. Some mods where indicated can be buggy and not function properly. Mods such as Freeside Uncut require higher-end computers to perform optimally. This mod requires Fallout 3. The mod is still in alpha and may be unstable on some configurations. Adds all the Fallout 3 content, including the world, quests, NPCs and items, into Fallout: New Vegas, as a separate worldspace. Can cause many conflicts with existing mods. ↑ 1.0 1.1 File/folder structure within this directory reflects the path(s) listed for Windows and/or Steam game data (use Wine regedit to access Windows registry paths). Games with Steam Cloud support may store data in ~/.steam/steam/userdata/<user-id>/22380/ in addition to or instead of this directory. The app ID (22380) may differ in some cases. Treat backslashes as forward slashes. See the glossary page for details.